The 5th OST (original soundtrack) for hit drama series The Moon Embracing the Sun is released on February 23rd, 2012. 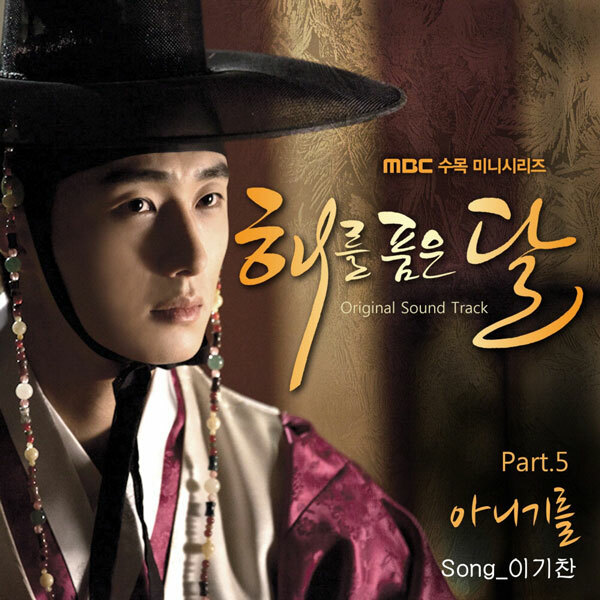 The Moon Embracing the Sun OST part 5 includes a song with the title of I Hope It’s Not (아니기를). The song of I Hope It’s Not is sang by Lee Ki Chan (이기찬). The song is composed by KangMin and The Name, and is written by Min Yeon Jae (민연재). The song name, I Hope It’s Not, is also been translated as “It’s Not” or “Not to Be.” The song first made its debut as the drama closing song at the ending credits part of episode 15. With the album cover art featuring Prince Yang Myung (Jung Il Woo), the song is widely regarded as the song of Yang Myung. Listen to I Hope It’s Not (아니기를) at YouTube.